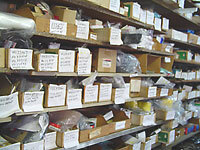 At Andover Small Engine, quality goes beyond the broad range products that we carry. It is our quality service which continues to place us above the rest. We use our experience, knowledge and expertise to help you make the right decision on the right product for your needs. And it does not end there! Year after year we can help you by providing follow up service and support from factory trained technicians for the life of your machine. When you purchase from Andover Small Engine youll own a product backed by over 40 years of experience in which we have always been dedicated to innovation and quality.